Now I know some people are going to wince at the thought of popping a .410ga shell out of a little thing like this: “Oh noes, Kim! It’ll break yore pore lil’ hand!” they’ll exclaim. Actually, it will do nothing of the sort. 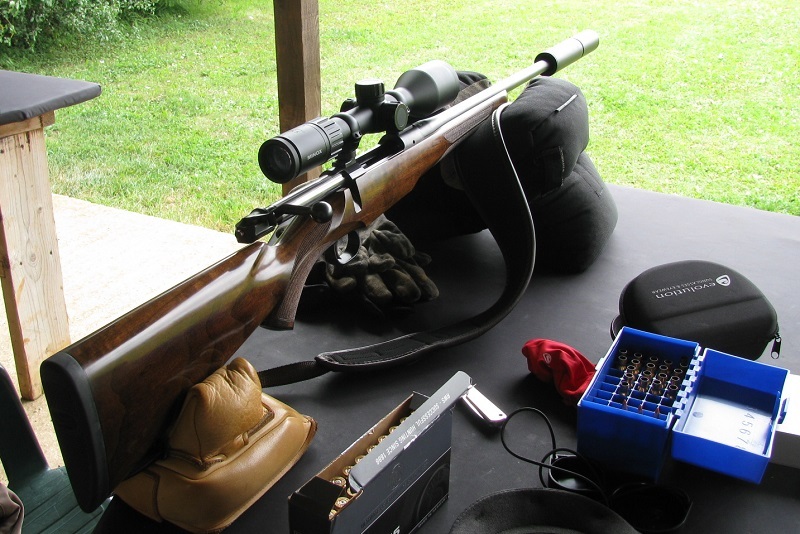 What causes recoil, as anyone will know who’s ever fired a .375 H&H Magnum rifle before, is the pressure build-up in the barrel as the boolet gets propelled from the casing. 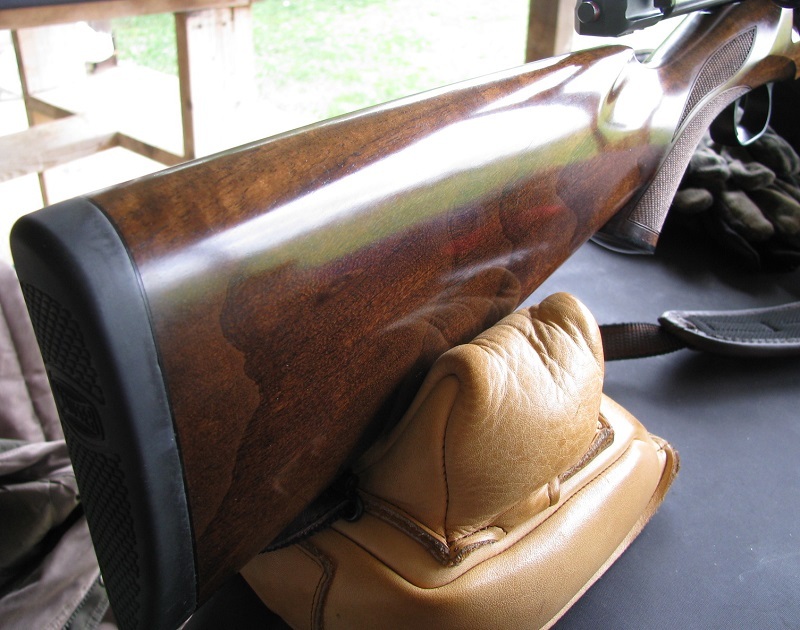 But with an ultra-short barrel, the bullet has left the barrel almost before any pressure can build up. There’s some recoil from the gun’s inertia being overcome by the propellant, but that’s not much to write home about. How do I know this? Yes, it was a little bit of a handful… the first time I fired it. But I have to tell you, I fired another dozen or so rounds immediately afterwards, and there was no sore wrist, no sore hand, nothing. 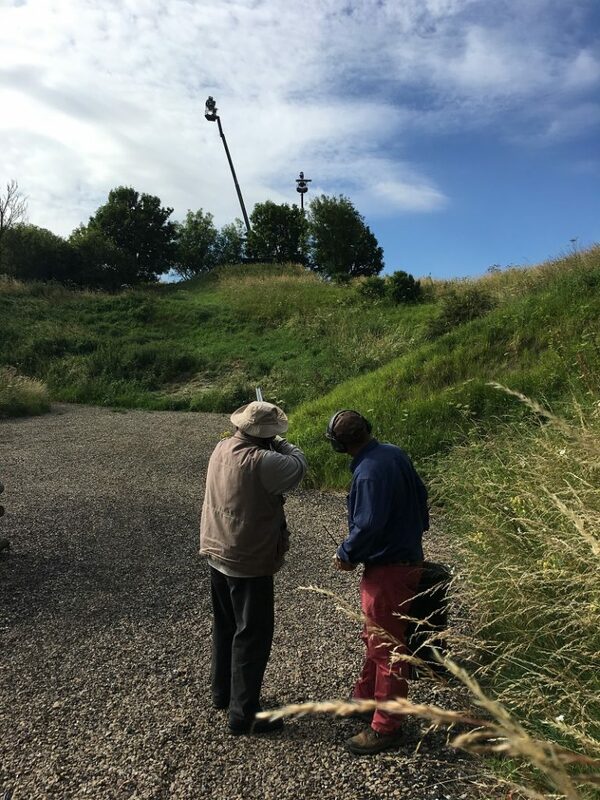 It was, in fact, a pleasure to shoot — and I really enjoyed watching the snake-shaped outline on the target almost disappear after the second load of shot hit the paper. I imagine it would do a similar job if fired into a goblin’s face at halitosis range, you betcha. 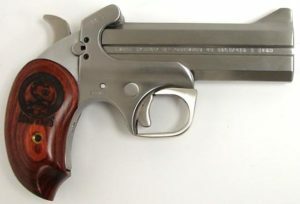 I like the cut of the Judge’s grip, too: more substantial than the Derringer’s means that the recoil is going to be even more manageable, and there are another three cartridges in the cylinder withal, if needed (doubtful). 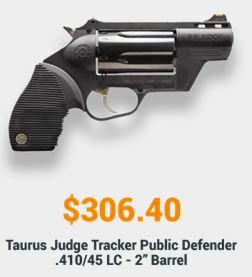 If there’s a better pocket pistol for varmint reduction (of any physiology, mind), it’s hard to think of one. If any of my Readers in the DFW area has one for me to try out when I return from Britishland, let me know. I’ll supply the ammo. Yikes. With only a tiny sight adjustment, I ended up getting sub-MOA (1cm) groups (with apologies for the metric nonsense, but that’s how the spotter called them) — that’s slightly less than 1/2″ groups at the 100-meter mark. 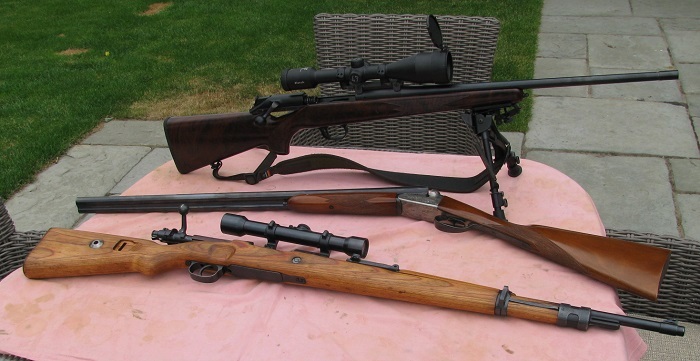 I took off the scope (via the quick-release Mauser ring system) and put it back on again — same zero, same groups. So that operation works. 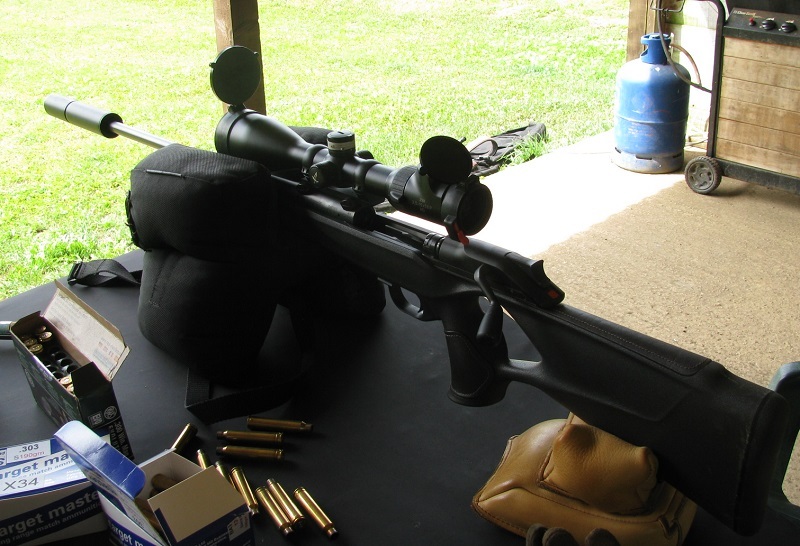 Then I removed the moderator — which, by the way, I want to marry so it can have my children — and added a simple muzzle brake, just to see the difference, and popped off a couple of rounds. Much louder, same point of impact. Mr. FM tried it out, and although the point of impact shifted (he’s a left-hander, ’nuff said), his groups were similarly sized. 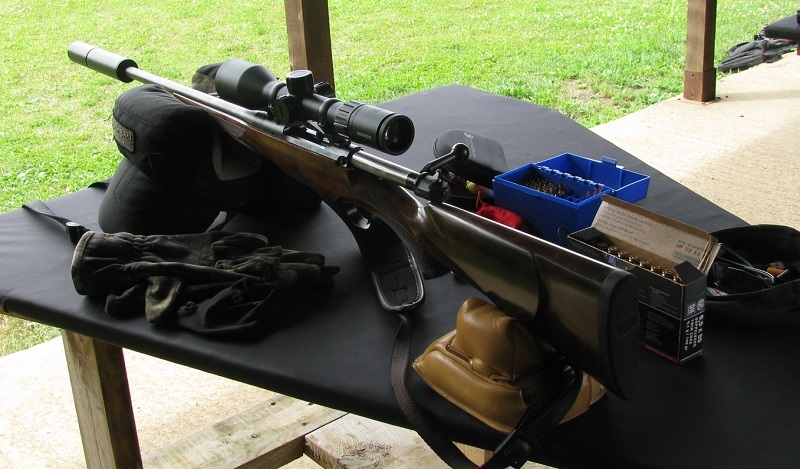 …which shall henceforth be known as the “DANE” (Death To Anything At The Naughty End) rifle. Come to think of it, mind you: that could also be the name of my M12. Another few hundred rounds, and I’ll be really comfortable with it, although it must be said that I’m more than halfway there already. What a lovely little piece. 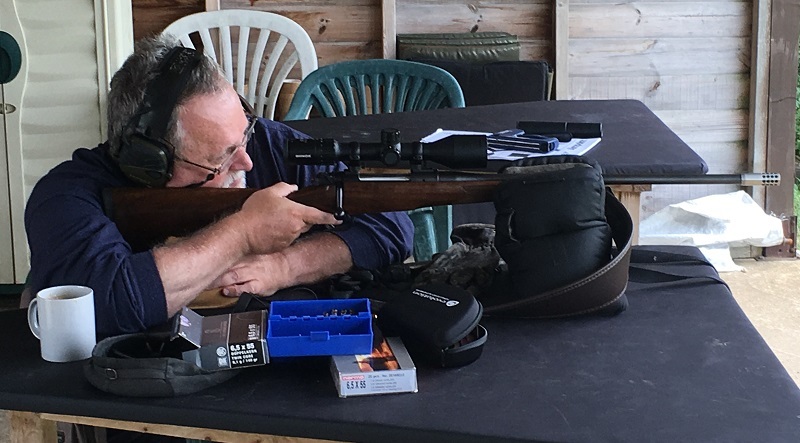 As Longtime Readers will know, I am reasonably proficient with most firearms: more so with rifles, less so with handguns — and hardly at all with shotguns. Of course, I’ve fired many, many shotguns of all descriptions: Browning A5s, Berettas, Franchis and so on, to name but some. But except at, shall we say, bedroom range, I would not consider myself at all skilled with a shotgun. 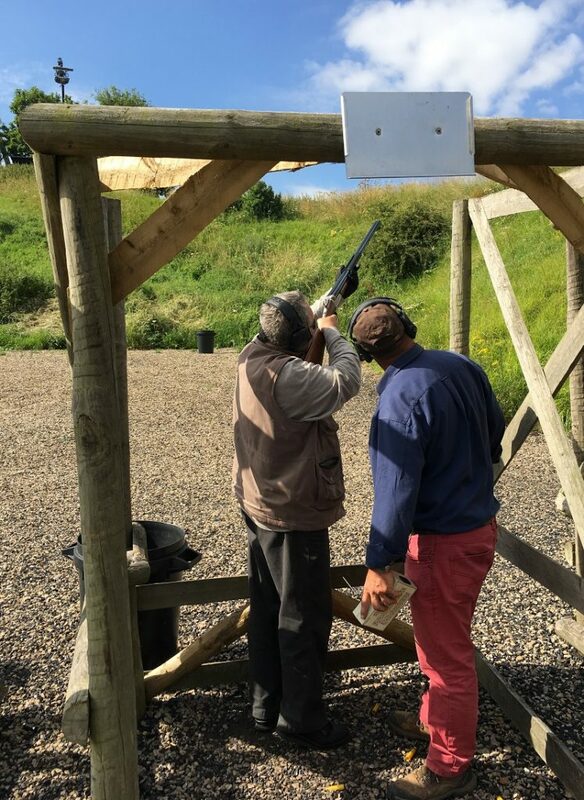 Certainly, I’m out of practice: the last time I shot clay pigeons was in 2005, at the Royal Berkshire Gun Club in these here British Isles. 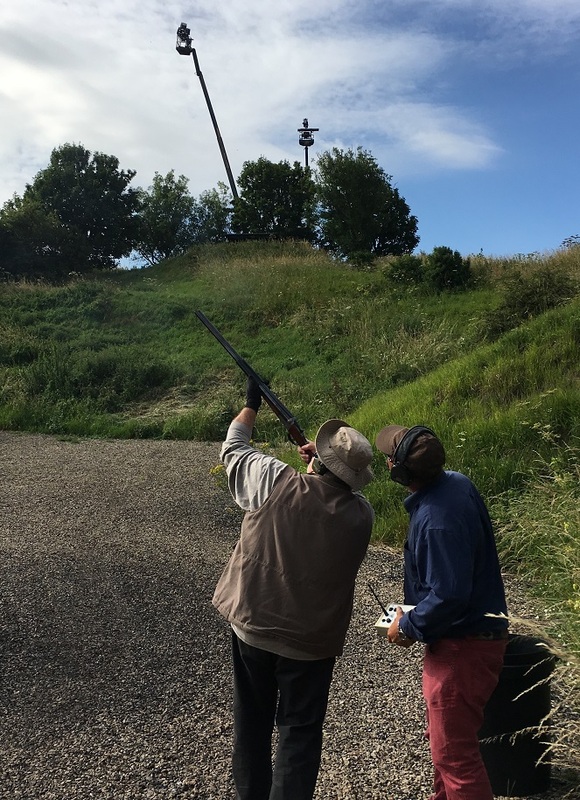 And come November I’m going to be doing some High Bird Shooting with Mr. FM (who is astonishingly good at the activity), so to avoid embarrassment, some instruction was obviously needing to be acquired. 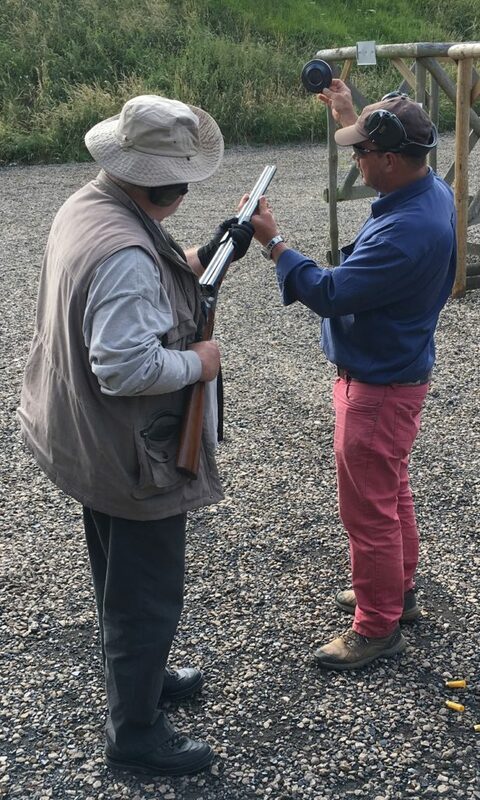 So the very day after the Great Mauser Incident of 2017, Mr. FM took me to the Barbury Shooting Club in Wiltshire to get some shotgunning lessons. These are the shotguns used on the day: my little side-by-side Kestrel 20ga, and Mr. FM’s o/u Berettas. My instructor Derek was a gem: endlessly patient, highly knowledgeable and quick to both criticize and praise. I have absolutely no complaints about the gun. 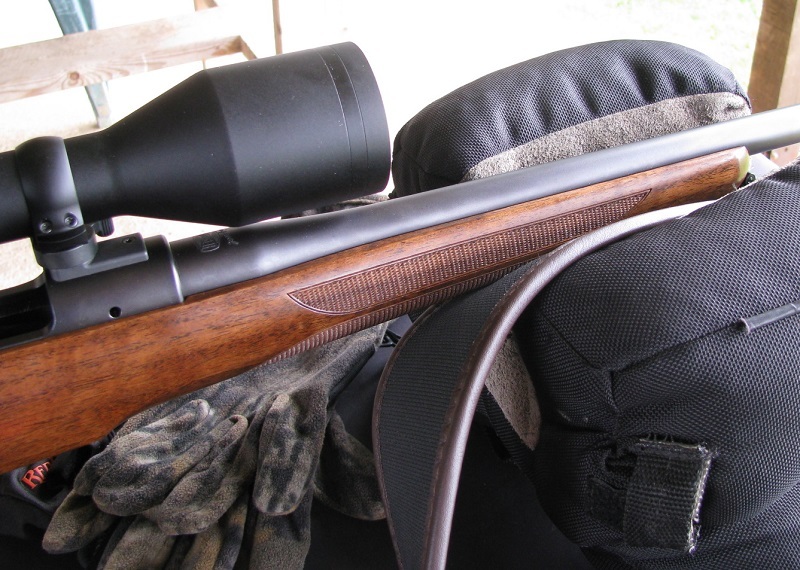 “My” Kestrel shotgun was a delight to shoot, and is far more accurate than I can shoot it. 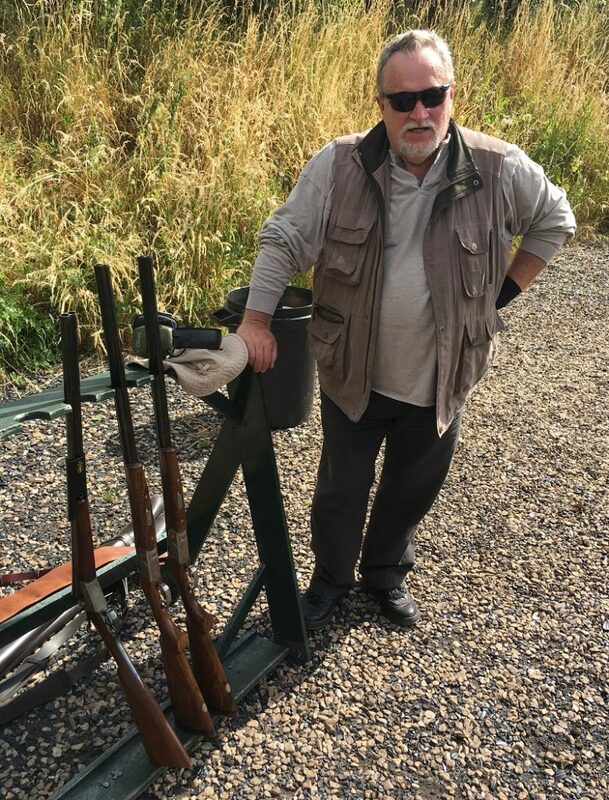 And yes, I was wearing a glove on my left hand, and the black thingy on the barrels is a leather sleeve — both designed to prevent blisters from a (very) hot gun barrel. This was very much necessary because after about a hundred rounds of 20-gauge delight, I had no blisters. I did, however, have a fist-sized bruise on my shoulder. The day after my Lord’s pilgrimage, Mr. FM suggested we take a quiet drive into the Cotswolds, some few miles north-west of FM Towers. He knows that I’m not one for scenic drives just for the drive’s sake, so he mentioned the magical words “in the Porsche” — and needless to say, that was sufficient incentive for me to agree. So we footled around along English country roads — me oohing and aaahing at Teh Scenery, which is spectacular: rolling hills, forest glades, farmers doing Farming Things, etc. Of course, it being a lovely day (sunny, warm, bees buzzing lazily etc.) there were the usual problems (i.e. cyclists), but the oncoming roar of a 3.6-liter Porsche engine usually had the desired effect of sending them flying into roadside ditches, which is all part of the fun of a summer drive. Then things took a turn for the worse. Much worse. We turned off the country road onto what can best be described as a farm road and ended up at a series of farm-type buildings. Over the door of one such building was a sign which read, cryptically, “R.J. Blackwall”. What place is this, I wondered, and then we went inside. 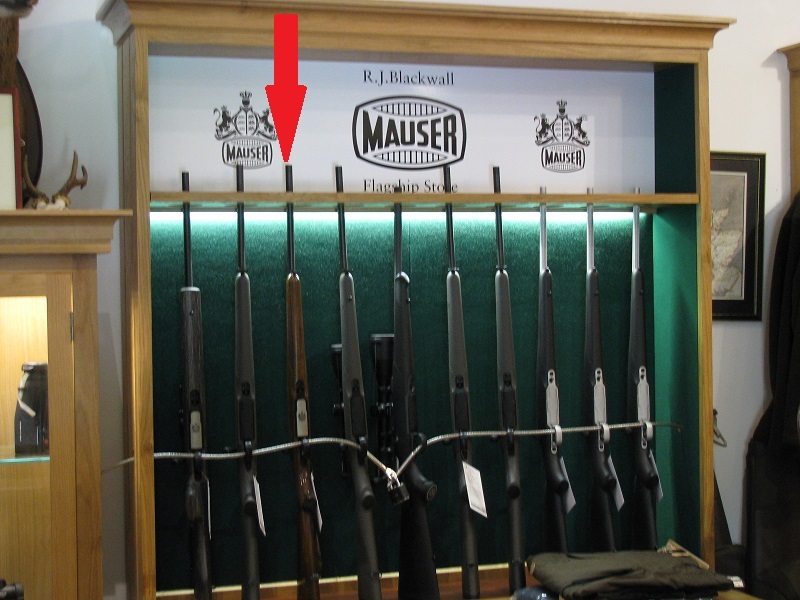 Rupert Blackwall is one of the pre-eminent Mauser dealers in the British Isles. O My Readers, I need first to give you a teeny bit of background so you can fully appreciate what was to follow. 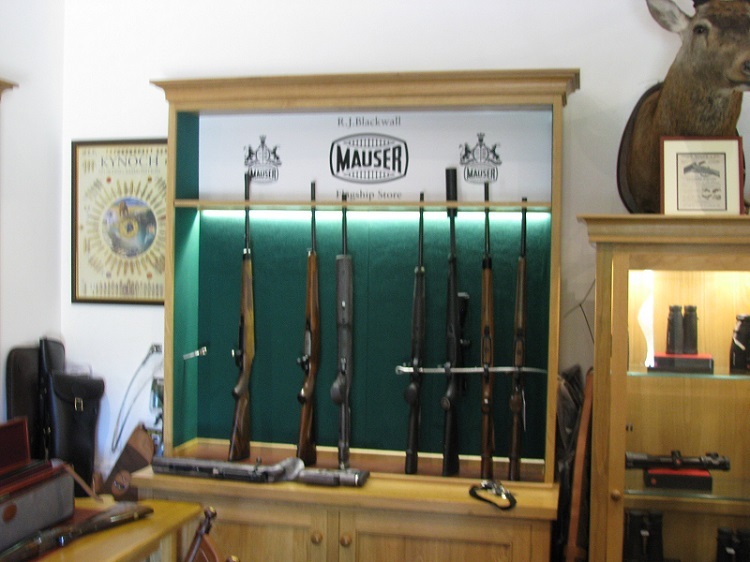 In the Great Time Of Poverty when I was forced to sell almost all my guns, I found myself, for the first time in my life, Mauserless. Never mind Mauser lookalikes or derivatives thereof; ever since I can remember, I’ve had at least one actual Mauser rifle in my gun cabinet — in fact, my very first gun purchase in the U.S. was a Mauser 98K. Since the Great Poverty, some four years ago, I’ve been without a Mauser — a fact I’d once lamented to Mr. FM, en passant — and only now did his devilment come to light. You see, he’d seen my reaction to the exquisite M12 I’d fired only a week before at the Corinium range and thus, I believe, had schemed a visit to this… this temple to Vulcan’s Dark Arts. 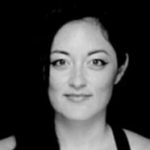 Of course, that’s not how he played it, the foul man; he chatted with Mr. Blackwall — a gunsmith of considerable skill and knowledge, having been trained at E.J. Churchill — about some rifle he was considering for his next African safari, leaving me to wander around the store and browse among (actually, drool over) the store’s wares. 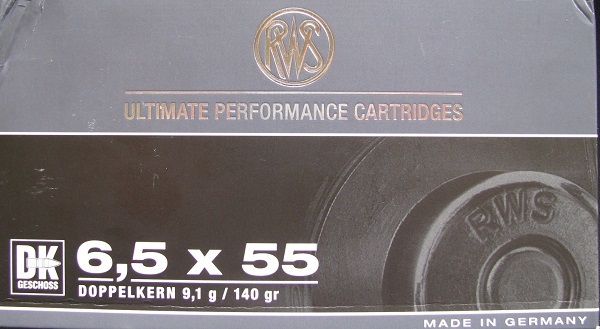 ..and there it was: a barely-fired Mauser M12, in… 6.5x55mm (my favorite medium caliber of all), at a price that, when translated into U.S. greenbacks, was not expensive at all. In fact, it was… affordable. Of course, one can’t just buy a rifle and walk out of the door with it, not in Merrie Olde England, oh no. In fact, I thought that I would not be able to purchase any gun, because (as we all know) in the U.S. such things are streng verboten (as I’d discovered when first I emigrated and wanted to buy a gun). Well, no. 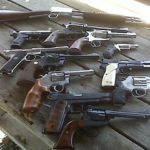 In the U.S., not anyone can buy a gun, but anyone can own a gun (mostly). In Britain, it’s the reverse. I could buy the gun, but I couldn’t take possession of it — it would have to go onto a British gun owner’s license — until such time as I would leave the U.K. And of course, standing right next to me, with an evil leer on his aristocratic features, there was just such a British gun owner. All that remained was to give Mr. Blackwall my credit card. I’ll be “testing” it over the coming weeks at Corinium, once I get a decent scope on it. 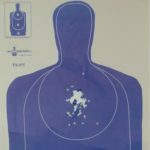 Range report(s) and pics to follow. 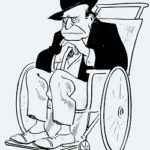 And most important of all, I am no longer Mauserless, so all my old Boer forefathers can stop spinning in their graves. Blaser R93 in 6.5x55mm Swede (my favorite medium cartridge of all time) — Mr. FM even put a wooden stock back onto the piece for me, such is his hospitality — and yes, that’s a Swarovski 4-12x scope resting on it. GMK Kestrel in 20ga. I cannot wait to put this little beauty through her paces, but she’ll have to wait till we get to a sporting clay facility. 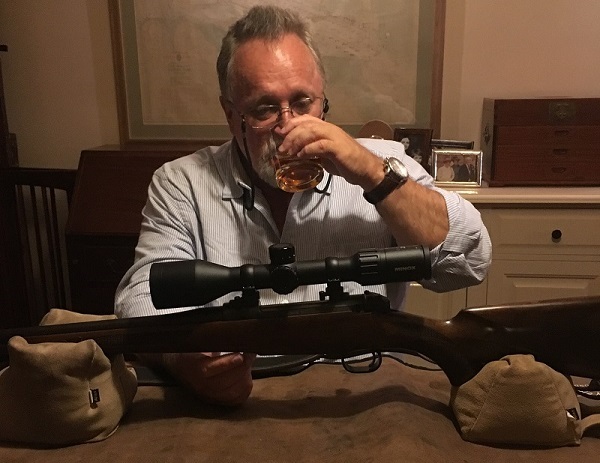 There will also be some .300 WinMag frivolity — apparently, Combat Controller left his Scotland Deer Slayer rifle and a few hundred rounds of “test” ammo behind, and wants me to make sure his rifle still functions properly after an accident the last time he was Over Here. Well, who can resist the request of a friend, right? No doubt my shoulder will be owie after all that fun, but a few pints of 6X / gin should take care of it. Feel free to vent feelings of jealous rage, etc. in Comments. Guess I won’t bother taking that class, then. Or maybe I will — only I’ll bring a Browning High Power as my primary, and my 1911 as a backup. 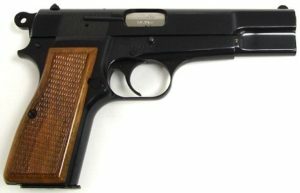 For those who are unaware of the irony (and there may be one or two), I should point out that both the Colt Government 1911A1 (1911) and the Browning High Power (BHP) were designed by the same man, John Moses Browning, and are functionally identical but for chambering (.45 ACP vs. 9mm Para respectively), magazine capacity (7-10 for the 1911, 12-15 for the BHP) and disassembly routine (which is irrelevant in this case). Other than that, both are single-action semi-automatic handguns, and I love both of them almost equally (because BHP = 9mm, a marginal self-defense cartridge). 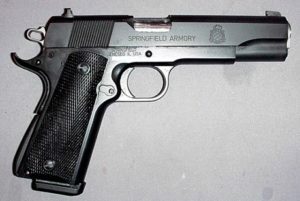 I have no idea what the NRA was thinking (or if they were thinking at all), but the 1911 is one of America’s favorite carry pieces and to exclude this wonderful gun from a “carry” class is doing a huge disservice to a large number of gun owners. On second thoughts, I won’t be taking the stupid class at all, because no doubt the NRA weasels would take issue with the way I carry my 1911 anyway. 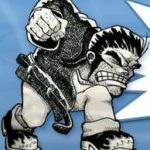 But that’s a topic for another time, when I discuss handgun carry. Watch this space.